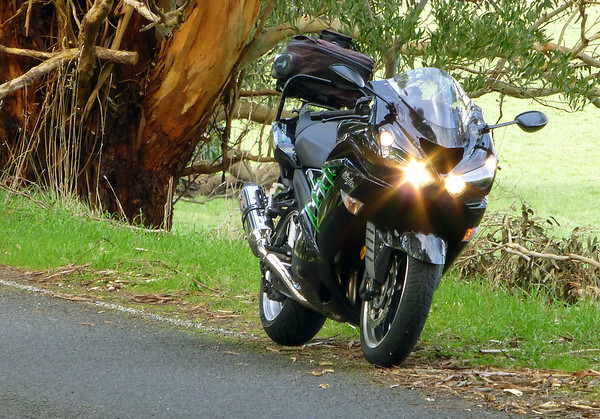 In September, 2013 I bought a new Kawasaki ZX14R – SE. This model has ABS, traction control and variable power modes. This was my second ZX14R purchase. I quickly got rid of the heavy stock pipes and added Yoshimura slip-ons. Strangely I didn’t bond with this motorcycle anywhere nearly as quickly as I did with the first one that I had. Maybe it was the tyres, but I struggled a little with the turn in and the cornering of this bike for about 5,000 kilometers! In April 2011 I replaced my VFR800 Honda on which I’d done 50,000 kms, with a new Kawasaki ZX14. It’s not far fetched to say that within riding 5 blocks from the dealership I knew that I had made the right choice – this was a motorcycle that I bonded with immediately! My approach to purchasing the Kawasaki is an example of just how much retailing is changing. The purchase of the ZX14 was transacted wholly over the ‘phone. Mrs Tarsnakes & I had looked at the new release Ninja 1000, however, once I sat on one with Mrs T pillion, I knew that it wasn’t for me – and I couldn’t take my eyes off the ZX14. See this post. 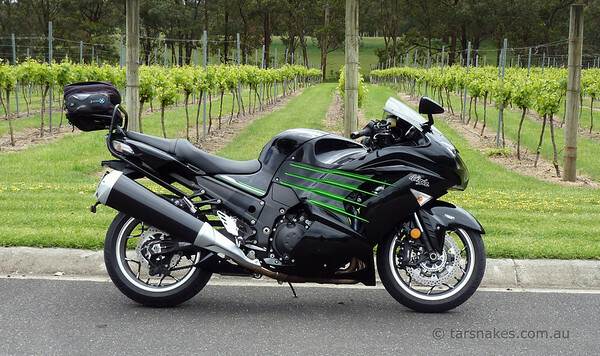 I did some internet research on the ZX14’s (ZZR1400 in the UK & Europe) and it seemed that they are a great bike but under appreciated compared with the Suzuki Hayabusa. I’d previously ridden a mate’s ZX14 on two occasions (thanks Bill!) and knew what a great machine they were and loved the ergonomics of it. So then it purely became a matter of getting one for the best price. I rang a few dealerships around Melbourne for their best deal on a cash purchase with no trade in. Their prices were all about the same mark and unfortunately all just a little out of reach! (Isn’t that always the case). Anyway, just to make sure that I’d covered all bases before I consigned the new bike purchase until 2012, I rang a very large Elizabeth St (Melbourne) motorcycle dealership . I spoke to a salesman and he proposed a ride away price that was $2K cheaper than the best price I’d had so far. An offer too good to refuse! After consultation with Mrs Tarsnakes I rang him back and said we’d take it. A $500 deposit via credit card secured the deal and I arranged to pick the motorcycle up a week later and pay the balance then. So the whole deal was done over the phone, with a salesman I’d never met to purchase a motorcycle that I hadn’t actually seen. All of which suited me perfectly – no stuffing about, no tire kicking and no playing silly games re pricing with a salesman. Welcome to a new paradigm of retail – the internet, a phone and a credit card.